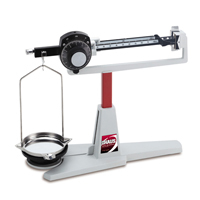 Ohaus Cent-O-Gram and Dial-O-Gram Overhead Balances offer the accuracy and convenience of an integrated weigh-below balance while allowing students to visualize mass measurement principles. Designed with a hanging pan system, both balances offer 10 times the readability of the Ohaus Triple Beam and Dial-O-Gram top-loading balances. The Vernier dial on the Dial-O-Gram 310 replaces two of the beams and is a great time saver. Self-aligning with beam design and special floating agate bearings, counterbalancing knob provides quick zeroing and stays in position, magnetic dampening for quicker results, durable with aluminum pressure casting for the base and beam assembly, removable stainless steel pan.